Last night my aunt (my only family member up here) and I went out for a coffee date, which was really just a 3 hour session of talking in our code language (quotes from Steel Magnolias, Best in Show and Seinfeld spliced together) about people. Oh and no husbands allowed! It's always a ton of fun, we have our little routine of going to the coffee shop, which is conveniently next to my favorite bakery in the world. We always have coffee then go to La Provence to get treats for the guys so they don't feel totally left out. ;) La Provence has the most gorgeous French desserts, which I do love, but their croissants are where it's at. 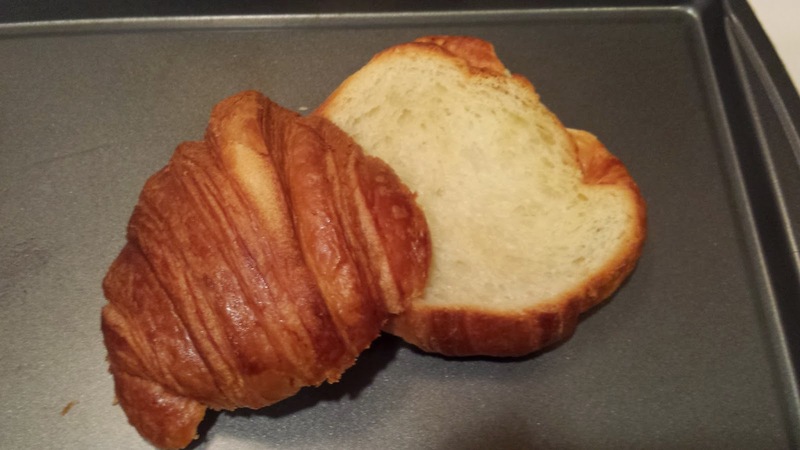 I've always kind of shrugged my shoulders about croissants until I tried these. I've never had anything like them in my life, every layer is like a crisp little buttery flake of heaven that is probably pretty darn close to what you can get in France. It's sort of a once a month thing for me, and it's the type of thing I was talking about in my rant where I said to eat the things you love. This is not my every day breakfast, but having one of these babies with a little pat of butter once a month or so is the type of treat that makes life super pleasurable. I know that flies in the face of most fitness and weight loss tips, that food shouldn't be a reward, that eating should be about fueling and not pleasure, but screw that. So Provence is pretty creative with their desserts, and most of them look like works of art that you feel sort of guilty about eating because they are too pretty to mess up. But then the smell of buttercream gets the best of me and I'm tearing into them like a SWAT raid. They also make bread and during various holidays they will make themed bread. Last month they had these adorable breads shaped/decorated like turkeys that you could order for Thanksgiving. 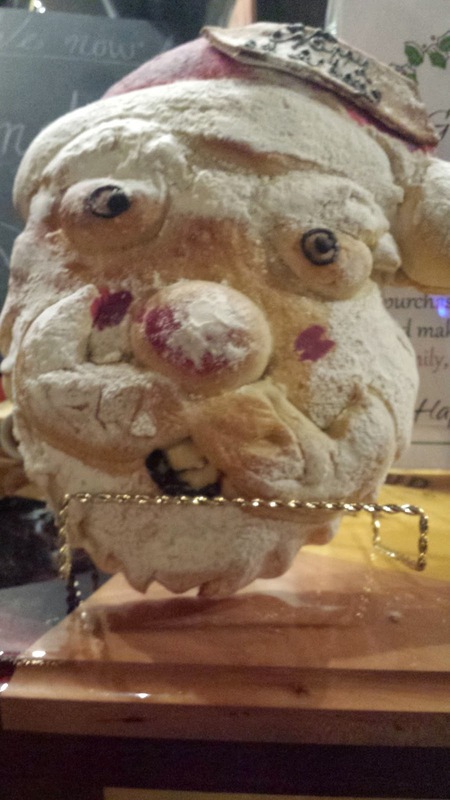 When we walked in last night they had these breads that were supposed to be um...Santa. My aunt and I are so immature, we could barely contain ourselves when we saw this, and had to take pictures of it when the girl's back was turned to get our stuff bagged up. I can't decide if it looks more like the Elephant Man with a Santa hat on, or that evil puppet dude from the Saw movies. It also has one snaggle tooth like an old timey gold prospector thing going on. Regardless, I will not be serving that Santa at my table. Today started out as a bit of a cluster. Usually I wake up with Eric at 5:30, but I guess I just slept right on through the alarm since I'm still not feeling that well. Next thing I know he's shaking me awake at 6:30 and is about to leave for work! I felt bad because I usually make the coffee and take a cup up to Eric, and I also feed Molly her breakfast so that she doesn't cause destruction and mayhem across the USA, but he had to take over all that today. I don't think I fully woke up until about 7 am and 3 cups of coffee later. I was pretty thrilled because today was a rest day on the schedule from the burpee challenge. I really hate them. I'm 5 days in and don't want to quit the challenge, but boy do I really hate them. The planks and the wall sits are challenging but feel gratifying somehow, but the burpees are so jarring. I feel like I need 5 bras on just to do them, plus it doesn't help that my lungs have been weird this week, so it's super hard to catch my breath after doing them. I did take Molly for a walk out of guilt since I hadn't for 2 days. She needed a walk, she was being a wild woman! It was colder than I thought it was going to be and I felt kind of bad since I'd forgotten her coat. She didn't seem to mind too much, but I just kept it to 40 minutes. And those pants are a large, not an XL thank you very much. It was nice to be able to pull that off. I did end up buying that green sweater you see in the pic, but I'm not sure if I'll wear it with the pants. I probably will, but we'll see. I was happy to get something in an emerald color, it's one of my fav colors, and you just don't really see it in sweaters much! All in all, a pretty good day! Love the pants! OMG that bread. You're right, a prospector or The Elephant man. I can't decide which! Santa looks drunk in that picture! Hilarious! 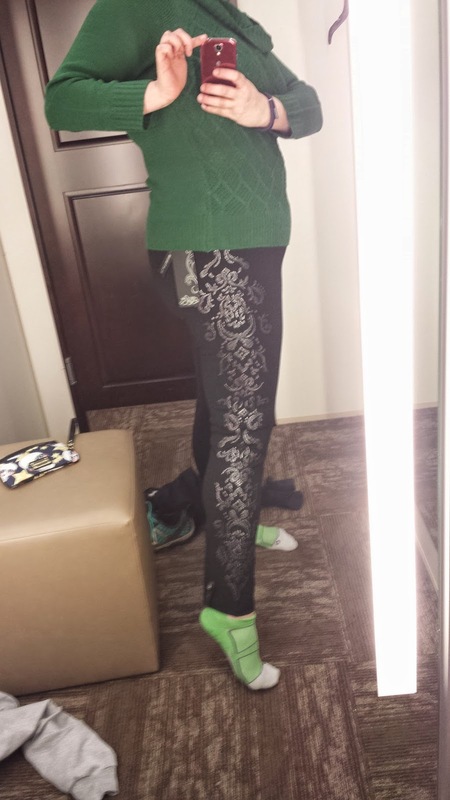 Awesome job on the pants, go you!